Contact - Call Bryan W. or Mike Y. TEXT OR CALL *JAMES JOSEPH* (440-339-6259) AT CLASSIC MAZDA FOR FULL DETAILS! A LIKE NEW VEHICLE WITH A BETTER THAN NEW WARRANTY! YOU WILL ALSO BE ABLE TO SAVE TAX BY SUBTRACTING YOUR TRADE VALUE FROM THE TAXABLE AMOUNT JUST LIKE WITH NEW CAR PURCHASES. 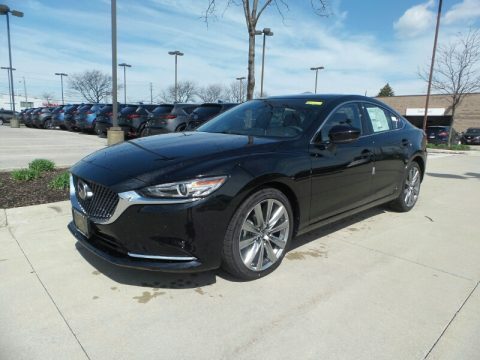 Well maintained by Classic Mazda's service department this 2018 Mazda6 Signature service loaner is an Amazing Value! Along with the balance of Mazda's 3 year / 36,000 mile Comprehensive Warranty, Certified Pre-Owned includes 12 month / 12,000 Additional Comprehensive Warranty and a 7 year/100,000 mile Powertrain Warranty with 24/7 Roadside Assistance! Our 2018 Mazda6 Signature is beautiful in Jet Black Mica! Powered by a TurboCharged 2.5 Liter 4 Cylinder that offers 250hp while connected to a paddle-shifted 6 Speed Automatic transmission. You'll love that this Front Wheel Drive yields near 31mpg on the open road and with our Skyactive Vehicle Dynamics with G-Vectoring Control, delivers brilliant handling that will leave you feeling exhilarated. Our Signature is a stylish performer that grabs attention with its sleek stance emphasized by its alloy wheels and signature front bumper and grille! Find your spot behind the wheel of this Signature edition in the supportive heated seats and take note of the sunroof, push-button start, and dual-zone automatic climate control. Stay safely connected while keeping your eyes on the road with our Mazda Connect infotainment featuring voice commands, a prominent touchscreen, multi-function commander control, Bluetooth phone/audio, and an impressive Bose sound system with HD radio, available satellite radio, and internet radio compatibility. A Top Safety Pick, our Mazda6 includes a host of safety features including a rearview camera, rear parking sensors, blind-spot monitoring with rear cross-traffic alert, forward collision mitigation, advanced airbags, adaptive cruise control, lane keeping assist, stability/traction control, and automatic emergency notification. Refuse to blend into traffic! Make a bold statement in our phenomenal Mazda6 sports sedan! PRINT THIS PAGE AND PLEASE REMEMBER TO ASK FOR *JAMES JOSEPH* TEXT OR CALL ME DIRECTLY AT (440-339-6259) TO HAVE YOUR TEST DRIVE PULLED UP AND READY TO GO! !